One of the amazing things that seem to appear as we engage ourselves in higher matters is this peculiar place or dance between God and His name, “Ha-shem”- literally the name. We know that God’s name is holy and unutterable and changing; therefore, we say “Hashem, the no name name” which is a substitute title for this endless, unknowable entity. A name is something that contains our potentiality including the unknown future. Often the future is supposed to remain a mystery, so the title “the name” represents a mysterious entity as well. Yet, it seems that there could be other reasons and insights for this separation between God and His name that contributes to understanding the meaning of our existence on earth and, perhaps, where we stand in the evolution of our perception on Truth, Divinity and relationships. We will illustrate through the prominent and often uttered prayers as well as the Kaddish, the Shema and some Kabbalistic insights. May the name of God be blessed forever and all eternity…. “May the name of The Holy One be blessed, praised, glorified, exalted, uplifted, honored, elevated and extolled”… a total of eight distinct verbs plus two which appeared in the opening statement of the Kaddish, the grand total of which may correspond to the ten sefirot/ways which Keter/ God descends emanation/ sheffa, to earth to Malchut. We always reply to “Blessed are You Adonai”, with “Blessed be He and blessed be His name”. This idea of two distinct, separate entities — that God’s name is not God himself — repeatedly appears in the Kaddish and other places in the prayer book. Why this separation? Why not just God? We see that not only are we addressing a separate entity referred to as “His name”, but that, God and His “name” are being called to eventually unite to a wholeness. We ask that it will happen as soon as possible, in our time. The prayer Aleinu concludes the line that: “On that day God and God’s name shall be One”, — an ideal vision for a time to come. Clearly, this separation between The Divine and His name implies two entities that are both distinct and related. Before we look at “His name” specially, let us remember the tremendous significance and meaning we have in this tradition when it comes to a name, receiving or changing a name. Adam’s first task in creation is to name everything. A name is what gives the named object its seal /goshpanka in creation. In receiving a name, we receive a specific divine stamp in the world of action (asiyah). We are here by the power of our name. Our name is our mission on earth. It includes both the present status and future potential. We exist because we have a name. Without a name, we do not have a full validation in all the worlds. As part of organic life on earth, we are literally connected to The Creator by the inherent power of our name. Each of us, as a direct descendant of Adam, b’nei Adam, wishes to fulfill the potential of our name, to be one with it. When we say the Kaddish, or when we say in the Aleinu “… on that day God will be One and His name One…” we are actually empowering the named creatures to realize their actual function and mission and to re-aligned with it. We empower them To Be. To be remembered. To reach for their highest possibilities. To achieve their full potential and purpose. To come to its fullness. It is the self-realization, by both mind and feelings, of itself, its name, and its identity. It is the realization of where we come from, and the purpose of our existence here on earth. Why empower creation and not God? It is we, God’s creation, that need the empowerment to awake and raise ourselves in unification with our Creator. It is we who need to be blessed so we can develop, play our role in creation and to know the Truth– The Truth about our place in relation to Him. God, the source of all blessings, does not need to be blessed, rather, He needs to be recognized, realized, honored, thanked and loved but not exactly blessed. It is reasonable to conclude that creation itself is “the name” of God. The entire Kaddish becomes a powerful “device” through its offering of ten elevating verbs, each one raising us closer to a level where we are able to continue to perform our mission on earth. Through the power of the Kaddish one may connect to the appropriate help and guidance which one needs at the time. So when we say the Kaddish, we really are requesting, as a beloved towards her lover: May God’s creation, “the name”, becomes strong, holy, capable to become one with the Divine in the fashion which the Divine intends for us to be. The Kaddish of the mourner, one of the most used variations of this powerful prayer, is said when we lose loved ones, parents, teachers etc. The Kaddish was chosen to be recited at this most distressing of times to re-affirm our position in the world, as if we have been- ”left behind”- to continue to live and handle our challenges. By saying the Kaddish out loud at this time, we set its intention in motion through the power of speech. We literally rededicate ourselves to remain here. We are being empowered by Ribono shel Olam, Master of the Universe, to have the strength to stay and continue our life tasks here on earth. Furthermore, we are being directed to recite it together with others to increase its power. It is the people, here in the creation, the mourners, who are in need, distress, agony, confusion, not knowing how to go on etc. They are the ones who need this empowerment. It is certainly not the time to praise God or wish Him to be more exalted and glorious or holy. The Kaddish fulfills and directs our needs in the most powerful and effective way. The Kaddish, in its own special way, unites these two divine forces; God and His name, by actually focusing on empowering the creation / His name to reach God, the source of all help. 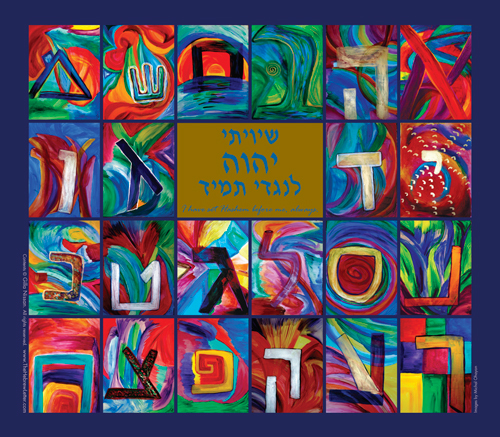 For generations across Chassidic and Kabbalistic circles, it has been widely understood that God wishes to be known by His creation as was detailed in the Torah and especially “Song of Songs”. Perceiving God both as a “whole” who seeks to be united with His creation was established in Zoharic and other Kabbalistic literature and sacred poetry, such as ”Lecha Dodi” / “Let Us Go, My Beloved”. Before reading certain holy texts, we set up an intention/ or kavanah to unite Creator and creation by envisioning it. It is only once the kavanah is set, that we proceed to read the text, recite prayers or perform Jewish ritual acts. This kavanah, if understood correctly, anchors our essential purpose or existence on earth by uniting God and His name. When we say, “Blessed is, the name of the glory, of His kingdom for ever and ever”. Who and what are we blessing? Who is the kingdom? Could it be this creation here and now? In the Tree of Life, Kingdom / Malchut is the world we live in. In the second phrase of the Shema, we are affirming and blessing God’s name, His kingdom, His creation. The Shema then says, Listen, who ever wishes to align himself or struggle with God, God is in relation with us, the Divine is ours. He is not indifferent and oblivious and He is the One, the unity and wholeness of all. Then we add, in a much lower voice, the affirmation that His creation, the glory and honor of the Creator, who needs the blessing desperately, be alive and in existence for ever and ever. The blessing is to her, His creation/Malchut/kingdom, His other missing half. We literally mean ”Do it for the sake of Your name, Your creation, Your partner, Your other half, what You call your image and your reflection. Elevate her, raise her so she can be what she needs to be, what you mean for her to be. It is not a call for God to justify His ability to be great but to use his greatness to lower Himself a bit more, to touch us, influence us and make us return to Him. “Lecha Dodi”, ”Let’s go my Beloved”, begins with arousing the cheshek/desire of God to meet His beloved. It is also a call for us, the partner, to awaken, not to fall into despair, to cheer up, to sing and dance, for the Beloved is revealing His kavod/glory. Posted in General Interest, Learning Opportunties, Poetry, Piyyutim and Prayers and tagged gilla nissan, hebrew, hebrew letters, jewish mysticism, Jewish poetry, jewish prayer, jewish renewal, kabbalah. Bookmark the permalink. This is lovely- I enjoyed learning about the masculine/feminine parts of G-D. Thank You!